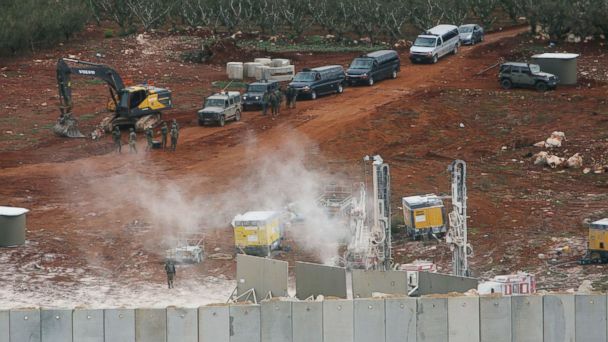 METULA, Israel -- Israeli Prime Minister Benjamin Netanyahu spoke with UN Secretary General Antonio Guterres on Wednesday to update him on the details of a military operation that will destroy cross-border tunnels between Israel and Lebanon, according to a statement released by his office. In his call with Guterres, Netanyahu's office said he urged the UN Chief to strongly condemn Hezbollah for violating Israel's sovereignty and the ceasefire reached in UN Security Council Resolution #1701. He called Hezbollah's tunnels, "part of Iran's aggression in the region." Netanyahu's appeal to the UN Chief came as the Israel Defense Forces held a prescheduled meeting with the United Nations Interim Force in Lebanon (UNIFIL) and representatives of the Lebanese Armed Forces. Both monitor the border between Israel and Lebanon, known as the Blue Line. In a statement, the IDF said it "presented the uncovered Hezbollah attack tunnel that had been dug from Lebanon to Israel." Some in Lebanon have questioned the IDF's tunnel claims despite a number of images and footage released by Israel purportedly documenting the sophisticated 6-by-6-foot underground passageway. The IDF says it has been tracking Hezbollah's attack tunnels since 2014 and expects to find and destroy several more in a campaign that will last weeks to months. "I'm not worried," said Leora Razklien, a 35-year-old who was born in Metullah. "I'm confident in the army, in the guys who serve to protect us." "There were reports for years that people here heard digging and construction late at night. They told the IDF about it. So why did it take so long?" he said.